It's time to see more of our gorgeous Roo Girls all dressed up in their Rissy Roo's dresses for prom! The latest comes from Roo Girl Christa Abbate, who recently sent us a picture all dressed up in her prom dress, accompanied by such a nice note that we're gushing so much. She chose a really unique La Femme prom dress that you definitely won't want to miss out on seeing. Check out what she had to say and her photo below! "I live in Colorado, the dress shops here in town were unable to help my order the La Femme dress I was in love with. I was worried about having to order online but after checking the La Femme site and realizing Rissyroos was an authorized retailer and legit, I felt better about my purchase. I also love the fact that rissyroos is a REAL store and not some sketchy online companies that are out there! I am so pleased with your customer service and how my dream dress was delivered to me within a few days! I will definitely use rissyroos again and thank you so much for helping me when the Colorado stores were unable too. I got so many compliments on my dress at my event!" Aweee! Thanks for sharing such kind words with us, Christa! We're happy to hear that you had such a great experience shopping at RissyRoos.com. 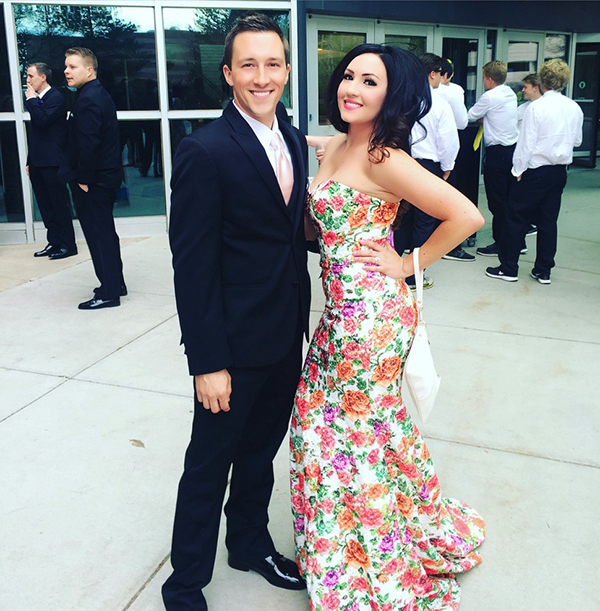 This entry was posted in Testimonials, Prom Dresses and tagged Prom Dresses, La Femme, Prom, floral prints, Prom dress, Floral Print, testimonial, Prom Dress Testimonial, floral, Prom 2016 on April 28, 2016 by Chrissy Roos. The bey-hive has been abuzz over the past few days over the surprise drop of Beyonce's brand new visual album "Lemonade." Beyoncé's sixth studio album is strikingly direct and is by far her most personal one yet. You'll find that infidelity is a major theme throughout many of the tracks, and her fans are rising up in support. Just as importantly, the themes of forgiveness and re-commitment can also be found throughout the album, making Bey the queen of statements that she's become. So, in solidarity with Queen Bey's powerful message, we're sharing a great way to get one of her most powerful red carpet looks: the beautiful Givenchy gown that she wore to the Met Gala back in May 2015. This entry was posted in Celebrities, Awards, Best Dressed, Red Carpet and tagged Prom Dresses, Red Carpet, celebrities, celebrity, Prom, Best Dressed Celebrities, Celebrity Inspired Dresses, Prom dress, Awards Season, Red Carpet Fashion, Awards Watch, Celeb Style, celebrity style, Celebrity Fashion, celebrity dresses, Met Gala, Beyonce, karishma, red carpets, awards, Prom 2016 on April 27, 2016 by Chrissy Roos. Every girl wants to feel like a princess on prom night, from the gown, to the date, to the transportation to the venue, to dancing the whole night away. Of course, with the popularity of promposals over the last few years, the days of feeling like a princess start as early as that special prom proposal. Whether funny, cute, or totally romantic, prom proposals are a special moment and bring a whole new level to the meaning of being a prom princess. One of the latest promposals that we've stumbled upon takes a cue from the romantic side and is all-over heart melting. Creating a disney themed promposal in itself is always so fitting to make a gal feel like a princess, but this teen really took the disney theme to heart. 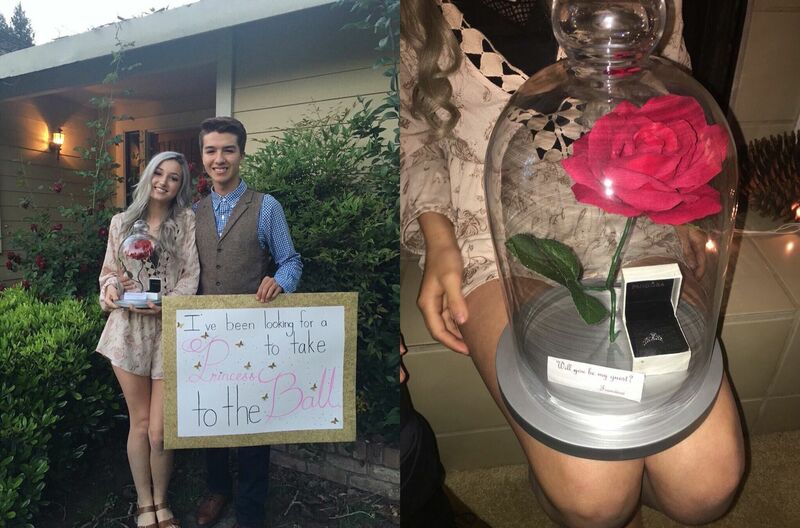 He created a Beauty and the Beast promposal, and hit all of the major points. Check it out below! "I've been looking for a Princess to take to the Ball"
This entry was posted in Promposals and tagged Prom, promposal ideas, promposals, promposal, Prom 2016 on April 26, 2016 by Chrissy Roos. Our Roo Girls are starting to attend their Prom 2016 dances, and while we're sad that Prom Season is almost over, we're loving seeing all of our Roo Girls in their prom dresses! 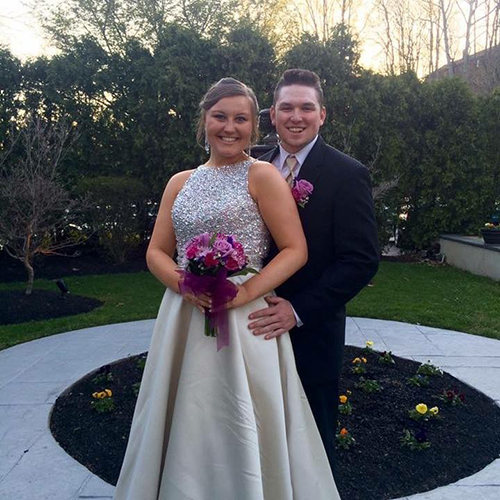 Our latest in prom pics comes from Roo Girl Kate Lannon. Her mom, Terri, sent us the pictures recently, with a very special note. Check out what she said and the photos below! "We loved the dress! We will be back again for homecoming and senior prom for sure! She looked amazing. Thanks, Rissy Roo's!" This entry was posted in Testimonials, Prom Dresses and tagged Prom Dresses, Prom, Prom dress, testimonial, Prom Dress Testimonial, Prom 2016 on April 22, 2016 by Chrissy Roos. We announced our Spring Cleaning Sale earlier this week, and with the start of spring cleaning at RissyRoos.com, came so many new 2016 prom dresses put on sale. The fact that these brand new spring dresses have been discounted isn't all, though - you can take an extra 25% off through this Saturday, 4/23, with promo code SPRING. We know... there are so many gorgeous dresses that it's difficult to choose, so we're here to help! Check out 5 of our favorite brand new prom 2016 dresses that have been recently put on sale. You'll oogle... you'll obsess... and hopefully you'll pick one to own at an incredible price! This entry was posted in Prom Dresses, Promo Codes, Sale Dresses and tagged Scala, Blush Prom, alyce designs, Prom, Promo Codes, Fashion Promo, floral prints, Blush Prom Dresses, Blush, Floral Print, Sale, Spring, Sale Dresses, Huge Dress Sale, Prom Dress Sale, Homecoming Dress Sale, Blowout Sale, Flash Sale, alyce paris, Promotion, On Sale, promotions, 2 Piece Dress Trend, Two Piece Dresses, alyce, floral, two piece, Prom 2016, Spring 2016, Angela & Alison on April 21, 2016 by Chrissy Roos.